Two Hands registered its domain in September 2006 and launched the site in November based on a customized installation of osCommerce. In December it reached out to SEO forums asking for advice. Some of the advice was good and was taken on board, such as switching from dynamic URLs to static (i.e. no ? & = characters), and addressing its duplicate site issues (both www.twohandsworldshop.com and twohandsworldshop.com were getting indexed). That I was happy to see, although the latter should have been solved using 301 redirects rather than BASE HREF tags. Regardless of what the folks at Two Hands do to the site itself while it sits in TrustBox purgatory, these enhancements will do little good. Off-page factors (clever link building and link baiting) should be the site owner’s immediate concern, as that is what will shorten the site’s time in the sand. It’s worth noting that this unfortunate situation could have been avoided altogether by acquiring an old domain (circa 2001 or older), preferably one that hosted a well-linked site with a long history in Archive.org, rather than just a parking page. I became certain of Twohandsworldshop.com’s sandboxed status as I conducted Google queries for product names like “onyx pillar candle holder” and “tropical silk coin purse” and had to dig deeper than the first couple pages of results to find Twohandsworldshop.com. Considering its backlinks, PageRank, lack of spamming and content-rich product pages with the product name in the title tag, one would expect to see a Two Hands product page on the first page of results for such obscure search terms — unless Two Hands had been sandboxed. The backlinks were rather weak, which is to be expected given how new the site is. Thankfully, a sitewide link from the blog of the founder’s father helped prop up the site’s link importance. Much more effort is required here, though. Not to neglect on-page issues entirely, there’s plenty to be done to improve the site. The home page definitely needs some work. When I viewed the home page in the Safari browser on my Mac, I got a bit of a shock, as you can see from the screenshot (above). It seemed like they ran out of budget halfway down the screen! That’s one heck of a long (and large!) H1 heading tag — four times too long, I reckon. It smells like keyword-stuffed doorway page copy. Upon inspecting the HTML of the home page, I found meta keywords and a meta description were present but left blank. If you have nothing to say in your meta tags, say nothing at all. In other words, either include some text in the meta tag or leave the meta tag code out entirely. In general, the HTML could definitely be improved by adding H1 tags to category and product pages and intro copy to category pages, as well as by reducing code bloat by removing all HTML comments and avoiding the use of tables for layout. 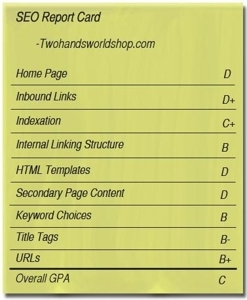 A number of pages employ the same exact title tag of “Two Hands Worldshop,” a big no-no, as you want to make each page appear unique to the engines. I was initially alarmed to see session IDs (osCsid) in the URLs. However it was a false alarm. None of those osCsid-containing URLs made it into Google’s index and only one into Yahoo!’s. Hats off to the folks at Two Hands for detecting spiders and selectively stripping session IDs from the URLs for them.